In a stunning announcement, Mayor Rahm Emanuel announced he won’t run for re-election during a press conference Tuesday afternoon. “On my first day as Mayor of this great city, I promised to make tough choices and face the hard truths we had not confronted, even when it hurts. Every day for the past seven and a half years, that is what I have tried my best to do – to improve our schools, make our community colleges relevant, put our fiscal house on stable footing, confront violence and rebuild trust between police and community, modernize our transportation systems, invest in our neighborhood parks and libraries and grow our economy into an engine of jobs and opportunity for all. 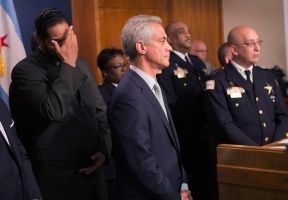 I’m not shy, and together we’ve never shied away from a challenge,” said Mayor Emanuel. “Today, the time has come to make another tough choice. As much as I love this job and will always love this city and its residents, I have decided not to seek re-election. This has been the job of a lifetime, but it is not a job for a lifetime. 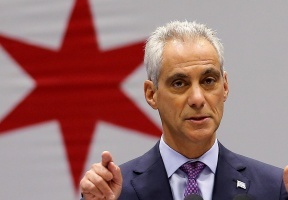 You hire us to get things done – and pass the torch when we’ve done our best to do what you hired us to do.” In the last eight years, Emanuel has experienced upheaval in the form of the controversial killing of Laquan McDonald, the $30 billion in unmet pension debt owed to city workers, the shuttering of 50 Chicago public schools, as well as the challenge of reducing gun violence. Amid his announcement, several public figures shared their reaction to the news.